One can easily distinguish this slim lady by her thin shoulders, among her heavy sniper peers tasked with protecting the nation in the long conflict with its neighboring country. Not passion, but a strong desire to put an end to a long-standing injustice was the key driver to her joining the militia. Now her only mission is to her motherland, which fell victim to an aggressive neighbor's attack. Over 20 percent of Azerbaijan's internationally recognized territory has been under Armenian occupation for over two decades. Azerbaijani sniper Vusala Mammadova, a mother to a child, is a woman endowed with courage, bravery, and intelligence, and who is keen on liberating the 1/5 of her motherland from foreign control. Modern military history offers many accounts of female heroism, demonstrating the tough responsibility taken in preventing bloodshed and restoring territorial integrity. Her childhood desire to become a soldier, made 25 years old Vusala an attractive candidate for the national army. She has served in the Azerbaijani army since 2014. Currently, she is taking sniper classes and is trained in using an OSV-96 sniper rifle. Vusala’s uncle was killed by bullets from the Armenian army. “People say that the uniform that we put on is the shroud of our martyrs. All Azerbaijanis like me, whose heart beats with love for the motherland, have the only desire to avenge our martyrs, and liberate our land,” she said. Armenia captured Nagorno-Karabakh and seven surrounding districts from Azerbaijan in a war that followed the Soviet breakup of 1991. More than 20,000 Azerbaijanis were killed and nearly 1 million were displaced as a result of the war. 33 years old, Konul Mammadli, who has also served in the Azerbaijani army since 2014, also wanted to be in the military since her childhood. Early on, she fulfilled her family’s desire to become a teacher. She, however, had always wanted to put on a uniform. Although she was born in Sumgayit, Konul’s grew up in Azerbaijan’s Gazakh region, a contact area, where young Konul often heard the sound of gunfire. “My biggest supporter is my father. I told my father I want to be a servicewoman. Years earlier, he prevented me from joining the military, but this time, seeing my desire and firm decision, he supported me,” Konul said. Konul, shooting an SVD sniper rifle, says that when aiming at a target, she imagines the enemy in front of her. The sniper believes that the most important task for the Azerbaijani people is to liberate the occupied lands. "We should not forget our sacred duty..." she said. 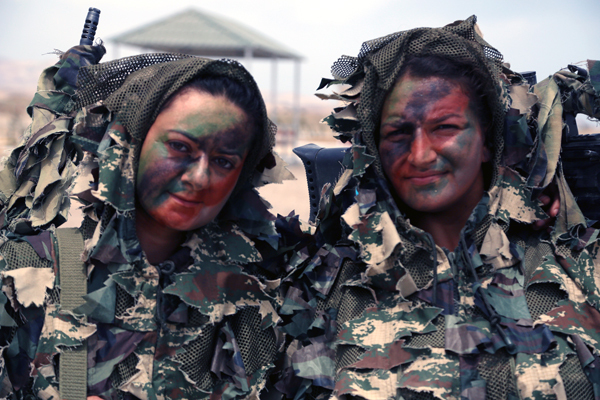 Azerbaijan is proud of her female soldiers who could write history during previous wars. Ziba Ganiyeva, fighting during the Great Patriotic War, the conflict fought along the many fronts of the Eastern Front of World War II, was the first Azerbaijani sniper to take this path. The extraordinarily beautiful 17-year-old girl was well known throughout the Soviet Union as a sniper, scout, and radio operator. She killed 129 enemy soldiers during the war. During combat, she nearly died of blood poisoning and was bed-ridden for 11 months. She returned to her duties following treatment. For her personal exploits and courage, Ganieva received numerous state awards. She died in 2010 in Moscow.